Most quilting fabric is about 40 inches wide. Since we have neither the tools nor the space to cut fabric this wide, you going to have to fold your fabric in half to get it to fit the mat and ruler. I fold my fabric selvage-to-selvage for this. To make sure your cuts are on the grain, make sure to line up the selvages such that if there was a gap between them, they’ll be parallel. It’s annoying to have to “waste” a strip of fabric like on the edge of this piece, but cutting on the grain really does help prevent fraying and stretching when you go to piece later. When the selvages are lined up with each other, you can be sure you’re cutting on the grain. The first cut you make with your rotary cutter is to square up the raw edge. Let me start by saying all measurements are made using the grids on your ruler and not your cutting mat. I repeat: Measure using your ruler, NOT your cutting mat. Cutting mats are marked with less precision than rulers, so that’s one reason to use the ruler. Also, your fabric is covering the mat, and the rulers are see through. So makes sense to use the ruler, right?! 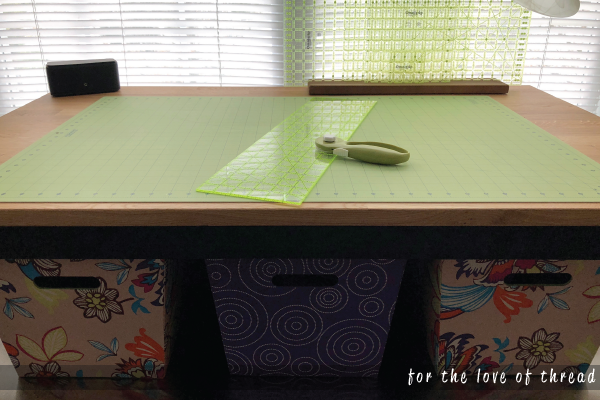 Line up the ruler with the bottom, folded edge of your fabric. Doing this will make sure you get straight strips and not strips with a slight “V” to them. 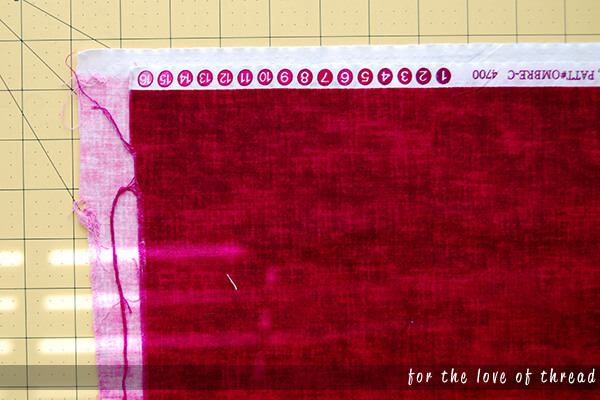 For the first cut, you want to make sure your ruler is lined up with the folded edge of your fabric. 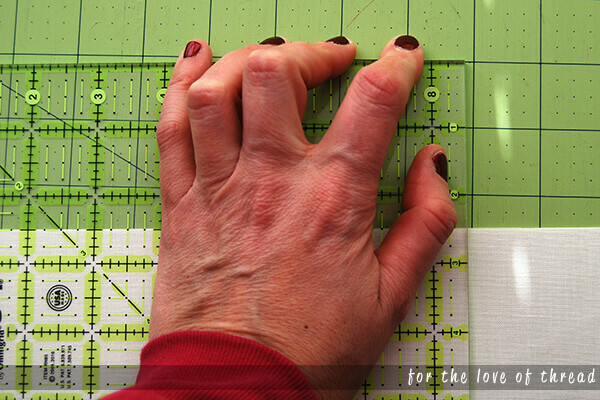 Once your ruler is lined up, cut off the raw edge of your fabric to square it up. You can line your fabric up along the center of the mark. 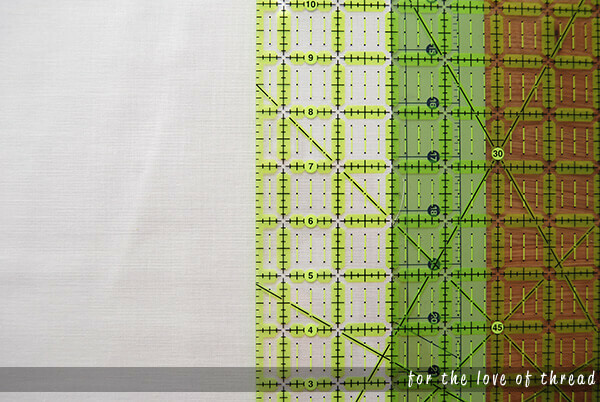 There’s no wrong way to do this, but you should pick a method and line up your fabric this way for every cut. Once you’re sure your ruler is lined up correctly, make your next cut. You now have a perfectly cut 2 1/2-inch strip. Congratulations! 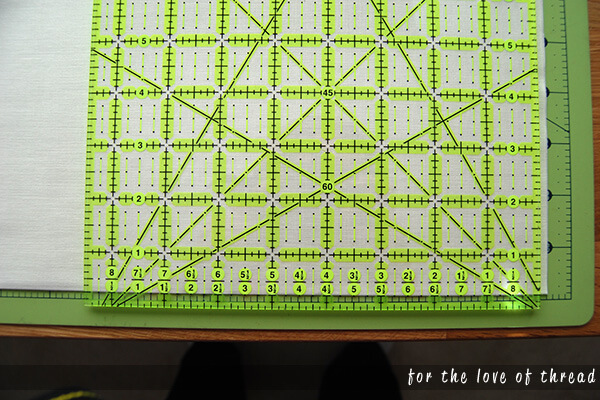 Line up the freshly cut edge of your fabric with the appropriate marking on your ruler. Here we’re cutting a 2 1/2-inch strip. Now that you have your strips, it’s time to cross-cut them into some squares. In the picture below, I’ve lined up my strip with the markings on the ruler and am ready to square off the raw edge. You cut your squares the same way you cut your strips, but I wanted to include this picture to share an important tip: If your whole hand is on the ruler, the ruler will slip when you make your cut. There are all sorts of sticky rulers and adhesives to put on rulers to make them grip, but the physics (or some other magical science) is clear: If your whole hand is on the ruler, the ruler will slip when you make your cut. To keep from slipping, I just make a weird “paw” with my hand and let my fingertips fall just off the ruler onto the cutting mat. This works for me every time. Every. Time. My strip is lined up with the ruler’s markings and is ready to be cut into squares. If you put a group of ten quilters in a room, I guarantee you’ll see at least ten different ways to cut fabric with a rotary cutter. I’ve tried other methods throughout the years, but the one above is the one that just works for me. Play around with different rulers, cutters, and methods until you find the one that’s right for you. 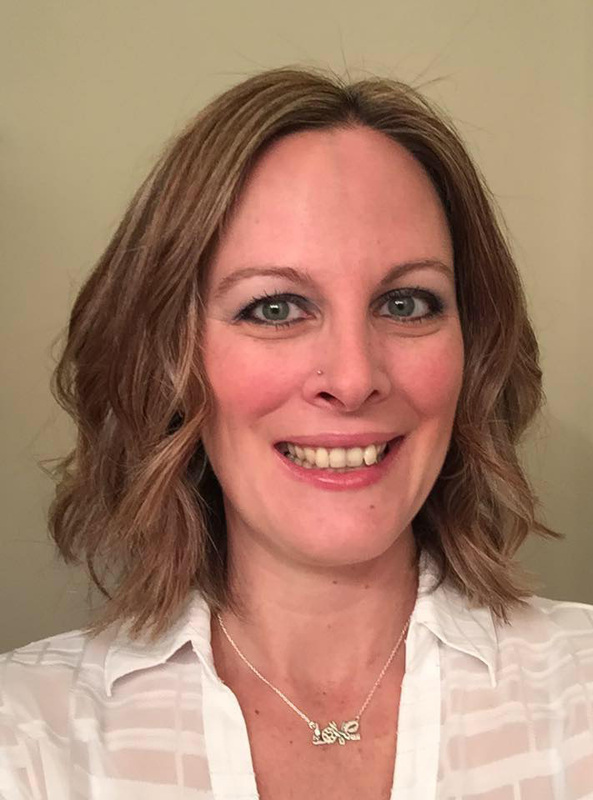 I hope you learned something new today and that all your future cutting is fast, easy, and painless!